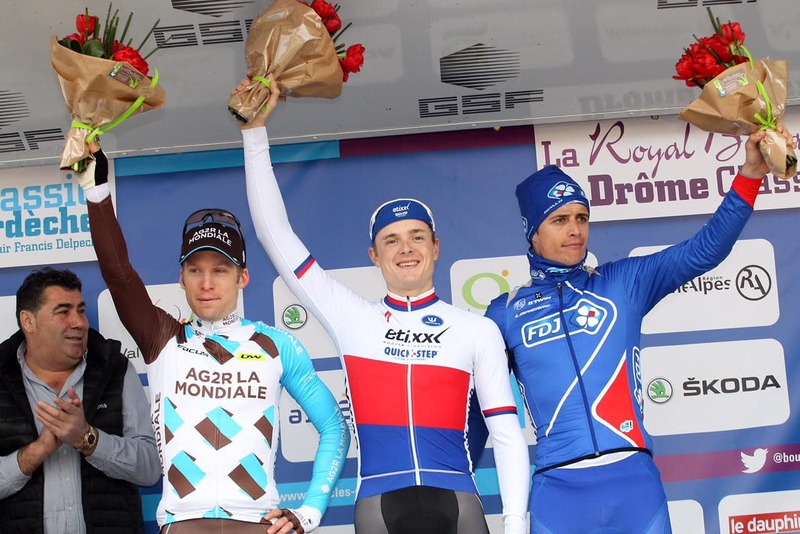 After winning the Classic Sud-Ardèche grabbed the Czech champion also profit in the Drome Classic. Petr Vakoč closed his strong month off appropriate. He became the first rider in one weekend both Classic Sud-Ardeche and Drome Classic won. Etixx – Quick-Step was also in this French classic front presence. The gap to the escapees Guillaume Bonnafond (AG2R), Jeremy Cornu (Direct Energy), Guillaume Levarlet (HP EDP Auber 93) and Anthony Perez (Cofidis) was kept within limits. The escapees were caught in the last 30 kilometers. David de la Cruz took the time to go on the attack. The Etixx – Quick-Step rider was Arnold Jeannesson (Cofidis) and Pierre-Roger Latour (AG2R) with it. The trio was not taken from the grasp of the pursuers – accompanied by Gianluca Brambilla – remain. Jan Bakelants (AG2R) the final climb used as a springboard and was immediately joined by Vakoc. The pair hit a small hole on the first chasers and sprinted for the win. Vakoc it was over quicker than his breakaway companion, whom he led to the double. Arthur Vichot (FDJ) if # 3 to the stage. Pieter Serry there was again reserved a place of honor. He finished 5th. “I’m very happy to win again, just 24 hours after my victory in the Classic Sud-Ardèche. It is unbelievable. The race was difficult again with narrow roads, which we all the time had to sit in the front. When I jumped Bakelants attacked them directly. I knew the final and knew that it was important to first get through the last corner. Bakelants anticipated well and was the first one through that corner, but I could not sprint past him in the final 50 meters, “said Vakoc before he was awarded the victory flowers on stage.